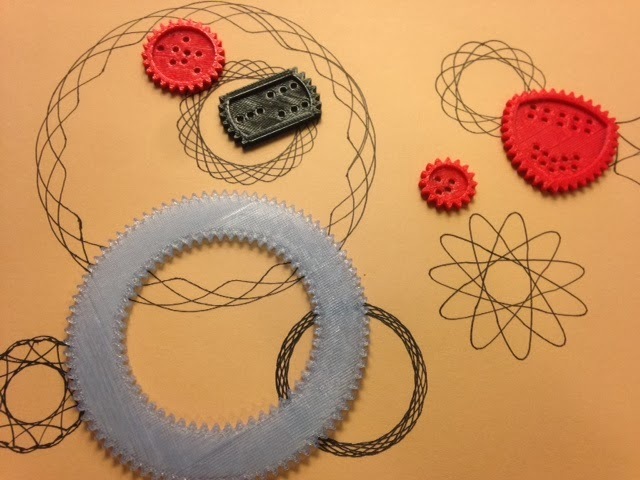 Thank you so much, Hercemer, for making a 41 Piece Spirograph collection available on Thingiverse! Settings: MakerWare .3mm/low on a Replicator 2, but my build platform is still a bit warped so I had trouble printing any rings larger than the blue one pictured here. I think it may be time to consider buying a new platform. Stuff to change: I couldn't get the rectangular and triangular gears to work very well, but that may be because I needed a different size of large ring, or because I used "low" instead of "standard" layer height. More experimenting later!